One high-school subject stands out above all others in my memory: Physical Education. I detested everything about PE, from the endless runs around a large undeveloped property near my high-school to Friday afternoons in the gym where we played “murder-ball”, our own sadistic version of dodge ball. I quickly learned that if I kept a low profile, and was discreet in minimizing my participation, I could still get by with a grade of “B”, or at worst a “C’. During the outdoor runs, I would disappear for a few rounds into a shallow ditch behind a row of hedges, out of sight of the gym teachers. My murder-ball strategy was to pretend I was hit early in the game when there were still so many players in the game that nobody noticed. For me, PE seemed a boring and unpleasant waste of my time. So when I heard a National Public Broadcasting program about the “New Physical Education” movement, I listened with great interest. The first part of the program described one important aspect of the New PE: fewer competitive activities (dodge ball was cited as a prime example) and more activities that emphasize personal achievement such as rock-climbing, kick-boxing and Tai-Chi. So far so good, I thought. While rock-climbing and kick-boxing probably would not have appealed to me, I think I would have enjoyed Tai-Chi, and probably benefited a great deal from it. But then, in the second part of the program, the whole question of evaluation and measurement was introduced. 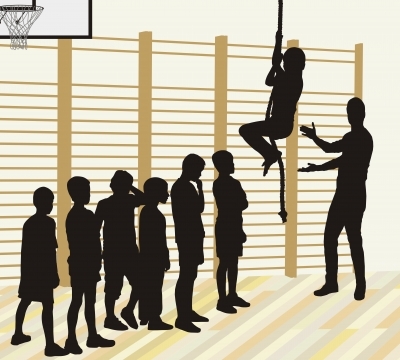 How are kids in the New PE programs to be graded? One approach, already in use in one Seattle school, involved attaching tiny heart rate monitors to the children during class. Then, when the class was over, the teacher could check the read outs and determine just how much effort each child had made, and grade accordingly. So much for minimizing strategies of the sort I had perfected! But there is a far more serious issue at stake here: This kind of measurement mirrors and reinforces the preoccupation of most adult fitness programs with the quantity of activity performed, rather than the way participants use their bodies while performing those activities. We tend to be interested in how many laps we swam, the amount of weights we lifted, or the speed of our runs rather than how well we used our body in performing those sports. In other words, quantity rather than quality. To see what this leads to, take a look at any group of runners or joggers. You will probably see tight necks, hunched shoulders and painful expressions on many of their faces. These runners may be getting a cardiovascular workout, but in the process they’re putting a lot of unnecessary and harmful pressure on their bodies. No wonder so many people who begin fitness programs drop out after a few weeks, often due to pain or injuries. Of course it’s important that children engage in vigorous physical activity; we don’t want them to grow up to be couch potatoes. But making “effort” the primary basis for grading students – even if it’s as easy as reading a heart monitor – does our children a great disservice. What makes this particularly sad is that we now know how to help people improve their movement quality. The twentieth century saw the development of numerous somatic therapies and teaching methods that have proven effective in helping people of all ages perform all their activities, from everyday ones like walking and using a computer right through to vigorous sports, with greater ease, efficiency and safety. The method I know best, first as a student and then, for the past thirty years as a teacher, is the Alexander Technique. It has a long history of helping people with stress-related conditions like back pain and stiff necks and shoulders and it is often used by musicians, dancers and actors to improve the quality of their performance. The Alexander Technique is taught by specially-trained teachers, but some of its principles could easily be included in PE classes. Take for instance the Alexander-related process that has come to be known as “body-mapping.” This approach includes learning, on your own body, just where important joints are located and how they function. It turns out that most of us have serious “mis-maps” of our own body which cause us to move in ways that attempt to reinforce those incorrect ideas. For example, many people think their hip joints are at waist level when, in fact, they are located far lower on our torso. Correcting this mis-map is quite easy to do and almost always results in much smoother bending, walking and running patterns. Another method that can easily be taught to children (and adults) is the Up With Gravity process, a simple way of using the power of gravity to release tension and lighten up. Wouldn’t it be wonderful if the New Physical Education programs included teaching these kinds of useful self-knowledge to our kids so they could go through life using their bodies as nature intended? And look back on their PE experiences with fondness and gratitude?